The gait and lower limb observation of paediatrics (GALLOP) is a very new, comprehensive assessment of questions and objective measures developed in 2016. Therefore, very limited research surrounding this proforma exists. Research suggests that children's gait is a frequent concern of parents and therefore they present to podiatrists and physiotherapists with their child regularly for assessment. With this prevalence, Peninsula Health conducted a quality assurance review across Australia, investigating what physiotherapist and podiatrist assessments involved when looking at children's gait and lower limbs. It was found that there was very little consistency amongst professionals, so GALLOP was created as a way of trying to standardise and develop consistency of assessments. A delphi study was conducted where 50 physiotherapist and podiatrists were invited to participate in the development of the GALLOP, but only 17 participants completed the process. These therapists were selected upon their clinical experience, background, recommendation or involvement in teaching and/or researching within the field of paediatrics in Australia. There were 4 rounds to the delphi study. 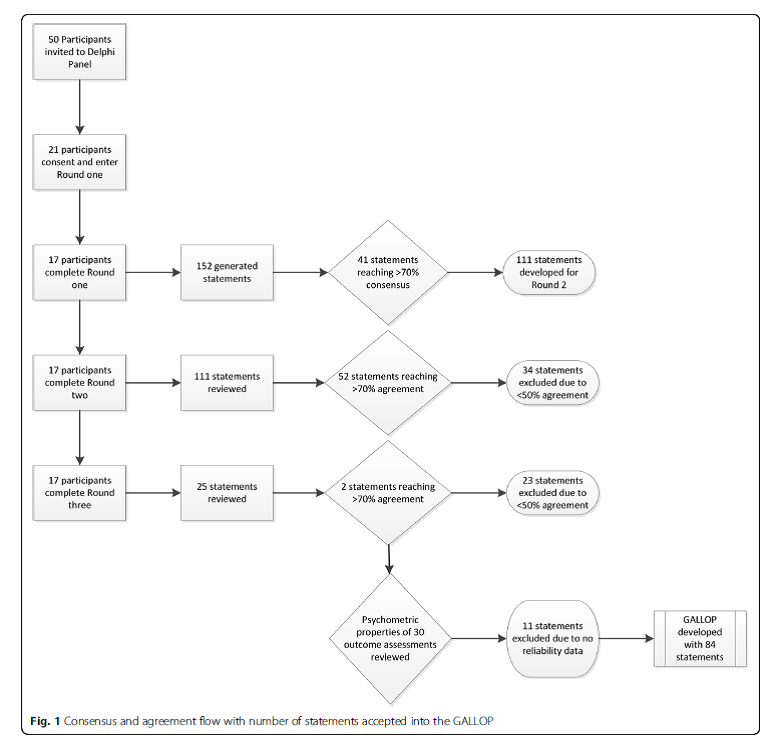 Individual assessment outcomes and proformas were collected alongside a literature review of gait and lower limb assessment in paediatrics which were included in the delphi study. The reliability and paediatric norms available on the assessment techniques that reached a consensus or agreement were exacted from the study. This information was then developed into a proforma which could be easily implemented into clinical practice. This delphi study, which lead to the production of the GALLOP, highlighted that due to the number of different assessments identified in the process, the only psychometric test that was considered was the reliability, and this was based-on the clinician's opinion only. Due to the lack of formal critique of the psychometric reliability of each individual assessment, a certain degree of caution should be used when implementing into practice. It should also be noted that a formal quality assessment of each of the studies included was not performed, although participants were advised to consider things such as sample size, administration intervals, analysis of data, and population group in relation to the study they were involved. Due to this proforma being such a new tool, no further studies have looked into psychometric properties, therefore it can be concluded that this assessment has face validity only. The results of the study which produced the GALLOP states that it should be considered by physiotherapists and podiatrists as a systematic approach to collect information and outcome measures related to the foot and lower limb within the paediatric population defined as 0-18 years of age.